The choice of armed professionals the world over, this proven design is adaptable, comfortable and contours to your body for excellent concealment. The 3-slot design allows strong-side hip carry, as well as appendix carry and cross-draw options. Our reinforced thumb break allows a quick break with minimal motion and the two-piece, contour stitch design is optimized for concealment and durability in even the worst conditions. 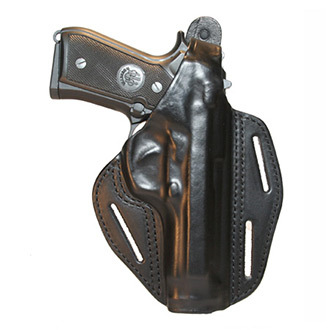 The molded design of this premium leather holster is made to curve to your waist structure and the belt slots pull the holster tight to the body for increased concealment. An ideal platform for larger handguns, it is also works equally well with the smaller guns many favor today.